For several months discussions have taken place about the area in front of the Resource Center. One of the challenges has been the emergency lane that runs through this area. Expanding the paved area would include the fire lane and part of the grass area. The addition of cherry trees would also add to our cultural goal for Tsuru Island. As seen in the Japanese culture, hundreds of cherry trees are planted in and around Kyoto. These trees signal to the people that spring is coming which is a new beginning. The site is beautiful when they are in bloom and when they are in leaf they provide a shaded environment that invites sitting and enjoying the area. Twelve Akebono cherry trees have been graciously donated by our friends at J. Frank Schmidt Nursery, to fill the area around the pavement and the benches. Just imagine coming through the park or walking along the Springwater Trail and seeing this site. The project will require more pavers than those left by other city projects. A grant is in the works to provide the pavers and hopefully the installation will be accomplished with the volunteers providing the labor. 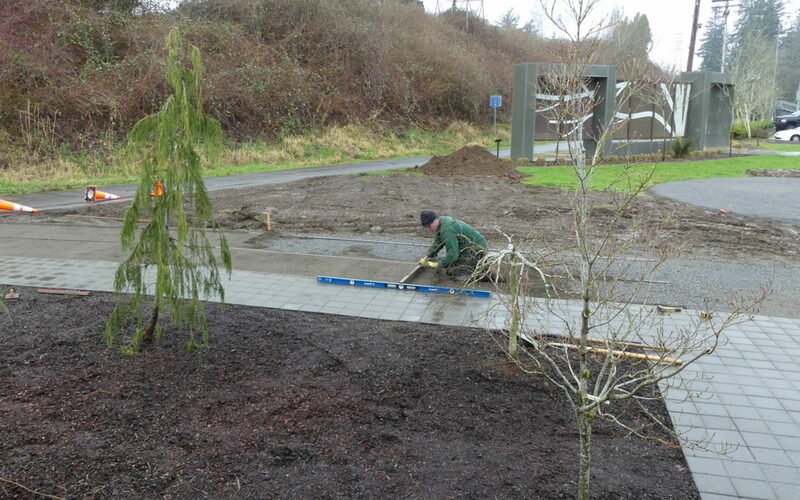 Now that there is a plan, the drawing, the OK to proceed, the trees and the pavers, there are still additional items such as benches, plant materials, soils, boulders and mulch to dress the planting areas. The benches will be made from the old bridge wood. The plan/drawing of the dimensions and procedures to make these Asian style benches are available and the process will be started soon. The soil and boulders will be moved from other City locations. The plantings and mulch have been donated and currently in the greenhouse. This will be completed within 1 year. The program will be spearheaded by John Clark, Garden volunteer and owner of Stamp-Connection. Individuals will have the opportunity to purchase engraved paver stones that will be used to construct the paved areas of Ebetsu Plaza. More coming soon! Check out the Ebestu Plaza Facebook page of the progress.